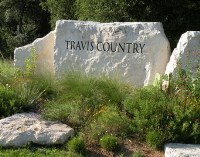 Completely updated, open concept home in desirable Travis Country. Home features chef's dream kitchen with gas range, SS appliances, island, granite and abundant cabinet/counter space. 4 spacious bedrooms (master down, 3 upstairs) and 2.5 baths; Master is very large with en suite bath that features double sinks and separate tub/shower. Office contains a closet and can be used as a bedroom. Large flagstone patio in the backyard that's great for entertaining; outstanding community amenities as well.